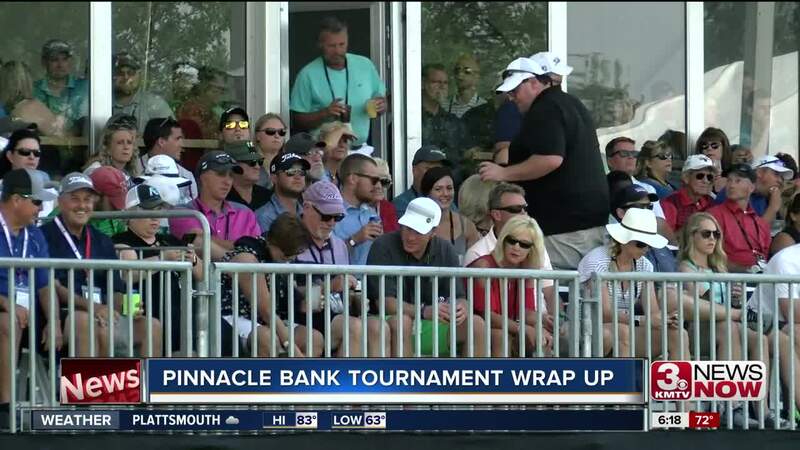 The Pinnacle Bank Golf Tournament wrapped up Sunday and organizers say the event was a success. In it's second year the event drew an even larger crowd than in 2017. "I would say that we at least have 40,000 people out here," said Jessica Brabec. This year's success may have a lot to do with the weather. "We have a lot more people out here walking and following the groups around than last year because the heat is a lot more bearable," said Brabec. "People are out there enjoying themselves," said Jessica Brabec. The weather remained in the mid 80's all week, fans say it made enjoying the outdoor event more tolerable. "Last year it was really hot, there weren't very many clouds, not much wind," said James Quaites. Other noticeable differences, James Quaites says the competition was a lot tighter. "Six guys tied for the lead with about seven guys tied for second, eight guys tied for 3rd, so it's a really competitive tournament," said Quaites. Brabec says they've made some adjustments since last year. "We've been trying to improve the volunteer experience and we've actually improved our sponsorship hospitality areas," said Brabec. Already looking forward to outdoing this year's event next year. "We are always trying to figure out ways to promote the event,"
"We are going to be that third week in July in 2019, so it's really important to get on people's calendar's," said Brabec. As far as the fans, they say they're just happy to have this experience in their backyard. "Really love the fact that this is held here in Omaha and I don't have to go to Des Moines or Kansas City," said Quaites.